Without meaning to sound boastful or big headed, I often get compliments on my skin. Lots of makeup artists have said nice things about it (though the cynic in me thinks they probably say this to everyone) and people often profess amazement about my age. They may just be being polite, but it happens often enough for me to realise that my skin is at least pretty good. The disclaimer being that, at nearly 68, my mum also has lovely and minimally wrinkled skin, so a good part may be genetic. 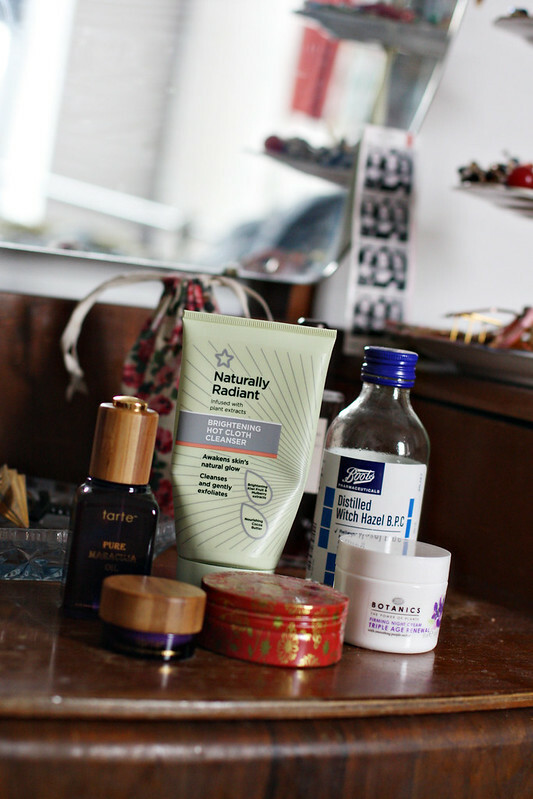 But that aside, I have been asked a few times to do a post about my skincare routine recently… so here it is! 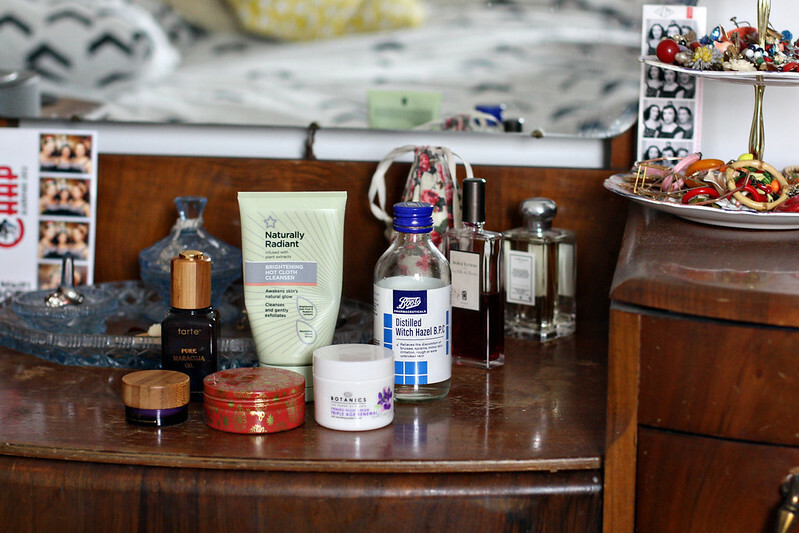 I did another skincare post a whopping FIVE years ago (where on earth does the time go), called How To Have Luminous Skin – The Vintage Way. Incredibly, this very old post, originally written for the wonderful Queens of Vintage, is usually still in my top 5 posts of any given week as so many people search for the relevant terms! And equally incredibly, my routine hasn’t changed a huge amount in that time. 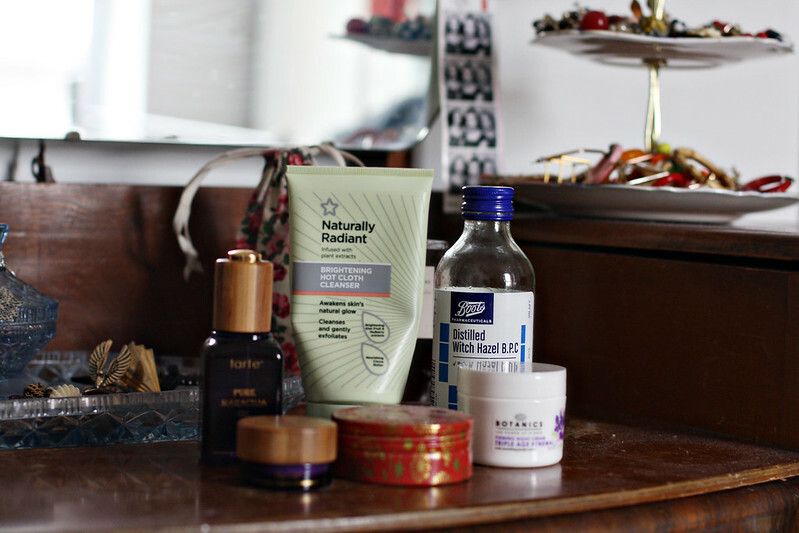 Here are my current skin-care heroes! I discovered this about a year ago and I love it so much, I have converted quite a few friends to its ways! I love the idea of natural extracts, even though in practice, most of these ‘natural’ products are full of the usual chemicals. Not to mention that natural extracts are chemicals themselves and can be just as harsh as man-made ones. But this cream cleanser, after being applied and massaged off with a warm, wrung out flannel, takes off all my makeup and leaves my skin feeling lovely – perfectly balanced and neither dry nor oily. If I have had a few too many drinks (ahem), I can do this single step and go straight to bed without doing anything else! NB. This double-cleansing routine I do is apparently something that’s approved by real skincare experts. After cleansing, I then follow up with the magical tonic. 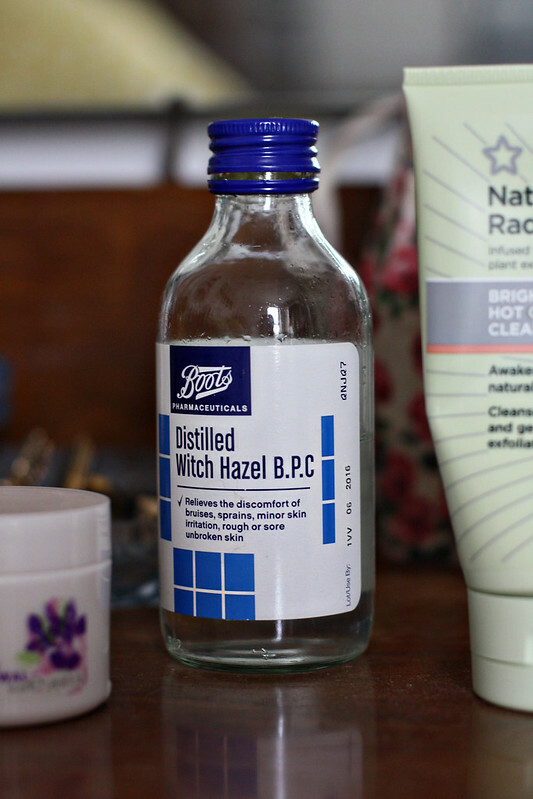 I’m no skincare professional but I never bother using any other toning product or astringent as witch hazel is perfect for my skin, and I’ve used it for 10 years plus. It doesn’t dry me out, but it does help shrink spots if I ever get any (which is rare and usually hormone-related) and just feels so refreshing after the cleansing. Works for me! Night cream is something I am still experimenting with. I started using it 3 or 4 years ago as I approached 30. 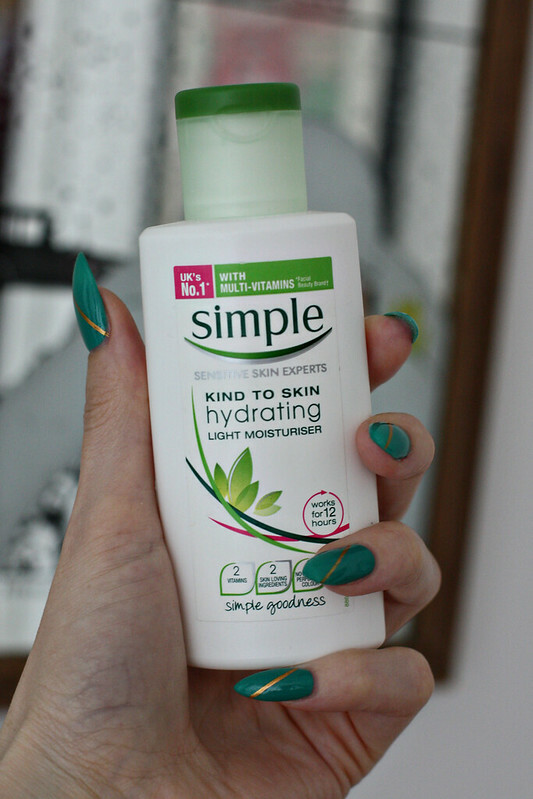 I like Simple products and have used their Age Resisting Night Cream in the past, which was fine. 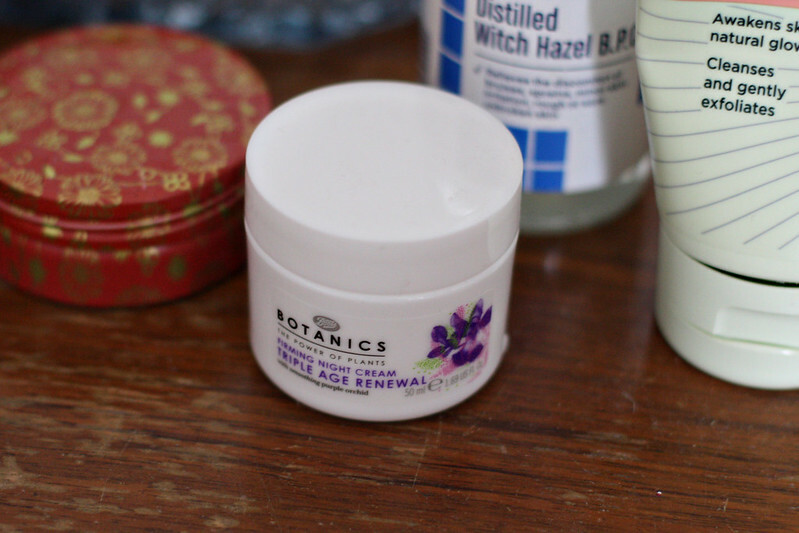 Then I tried Botanics Radiant Youth Night Cream, which I loved, but my boyfriend complained literally every night that it ‘smelled like twigs’, so when it ran out, I picked up this Triple Age Renewing one. It’s A LOT thicker, and I suspect formulated for older skin, but it hasn’t broken me out and it smells a lot less like twigs. So at least I don’t get pointedly sniffed every single night. Side note: the Botanics 81% Organic Day Cream is also brilliant and contains almost no man-made stuff, mine has literally just run out and been thrown away. My only complaint is it’s really hard to scoop out cream from the bottom of these tub when you have long nails. Now, facial oils are something I have used on and off over the years. I have had a vial of organic rosehip oil for ages, but remember to use it so rarely I think it might have gone off. So when US based cruelty/chemical/SLS/paraben and even gluten-free Tarte Cosmetics got in touch and sent me a load of cosmetics to try out ahead of their launch on QVC here in the UK (keep your eyes peeled for the review of the makeup they sent me when I’ve tried it all), I was intrigued by the Maracuja Oil they included. For the last week or so, I have been adding three drops into my night cream and one into my day cream. It is LOVELY. I am quite normal-skinned, slightly combination in the t-zone but not too bad – this oil doesn’t leave me greasy at all. I genuinely think it’s made my skin glow! At 32 it’s impossible to fight the early appearances of lines around the eyes and mouth (at least if you smile and laugh a lot, which everyone should!) but it has made them virtually disappear. A potential candidate for wonder product of the century! I will keep using it to see if it will break me out, but so far, so good. I also got the Maracuja eye cream, which is also being used in the evenings and also seems to work very well. Before I got this, I’ve been using the Botanics Organic eye cream for around a year, also very good and probably one of the reasons for my eye wrinkles being minimal. 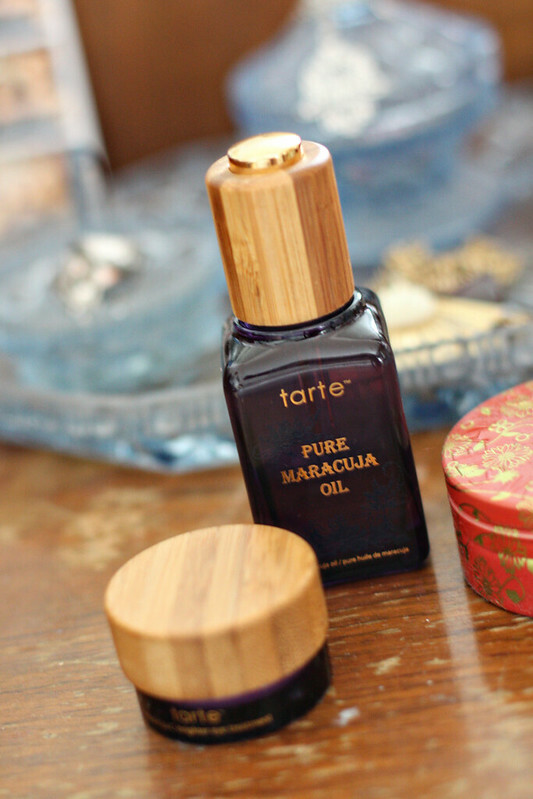 An additional plus with the Tarte stuff is that the packaging is also lovely – that’s real wood and glass right there! It’s pricey but I would certainly consider replacing it when it runs out at this rate. In the mornings, I pretty much just rinse my face with water in the shower, but every other day or so I use Lush’s Angels on Bare Skin cleanser. Another entirely natural one (unlike many of Lush’s products, contrary to what they would have you believe), the ground almonds exfoliate without microscopically ripping your pores like scrubs that contain ground up peach kernels do. I love it, but there’s no picture because after 3 months in the shower, my tub is not remotely photogenic. As the other mentions above might indicate, I have been a lifelong Simple user, so that’s what I’m currently using as a day cream. I’m under no illusions that it’s ‘natural’, but the fragrance-free aspect appeals to me. I forgot to put it in the ‘group’ shot, so here’s an excuse to show off my awesome new nails! As a bonus, another product I was sent recently to try out and can recommend is Steamcream. 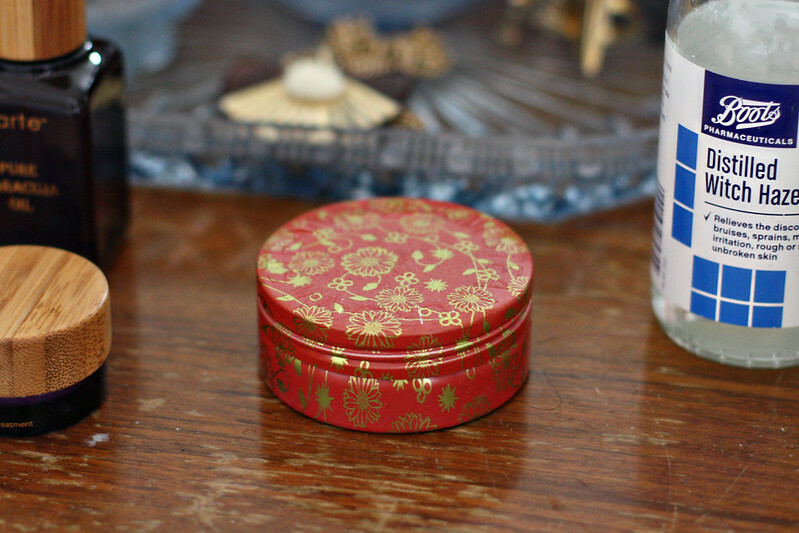 My bestie Bethan used to have a pot on her bedside table and it comes in such a gorgeous array of tin designs, it’s definitely part cream and part dressing table accessory. It’s natural, vegan, handmade, high quality and ethical, contains all these lovely ingredients and is approved for the face, hands and body. But I find it a bit too strongly fragranced for my face, so I use it on my hands last thing at night. It feels more like a treat than just a routine! I find applying hand and body cream extremely tedious and kind of can’t be bothered most of the time, so my hands are currently getting a nightly treat. Lovely! I would buy this, definitely. Bonus dressing table shot as I tidied it especially for these photos! What are your skincare heroes that you can’t imagine not buying unless, gawd forbid, they stop making it (which happened to my last favourite cream cleanser)? Glad rags at the ready! Thanks for the update, from one of those who had asked. I've just discovered the beginning of an eye wrinkle, so definitely going to have to purchase some eye cream tomorrow to stop that bad boy. Definitely recommend the Botanics organic one and it's often on offer. I don't fancy the strong anti ageing ones like Protect & perfect etc. The Tarte oil sounds really nice, too! I went through a couple of tubes of the Vit E one before trying this one – I liked that but I like this even more! I doubt I'll ever stop using witch hazel. That and using spf since I was 15 I am convinced is keeping me looking young. People are often suprised that I am 31. I also like to use coconut oil on my hair and skin, luckily my boyfriend likes the smell of it?! Have you tried it? 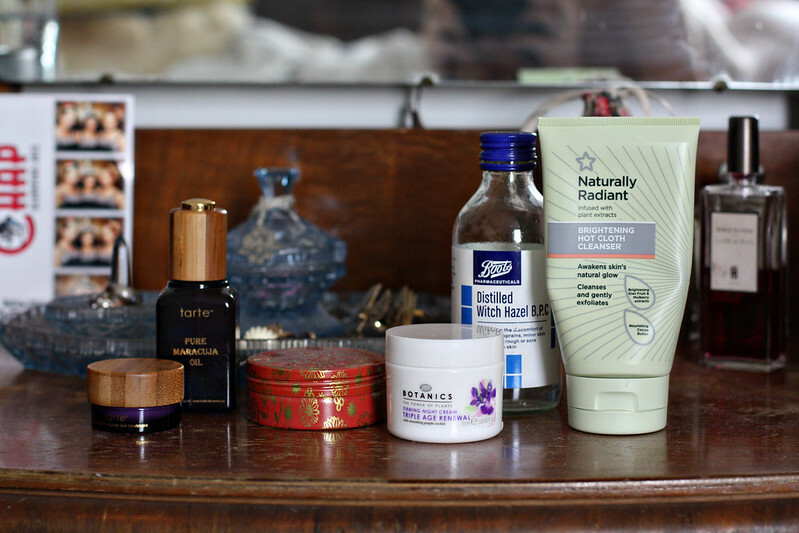 I'm a bit of a skincare geek so I love seeing what people use! I use that hot cloth cleanser too, I really do think it's as good as most high end things and so reasonably priced. I am going to keep my eyes peeled for the maracuja oil, I'm a bit of an oil addict these days. It might be worth checking out ebay or something similar to see if any other manufacturers make the same thing as I imagine it'll be cheaper than Tarte! Worth a try anyway. Witch hazel really is just the best. I have the weirdest combo skin, and it really helps keep me balanced. I've also been loving using an oil after my moisturizer, which seems to help lock the moisture in and, oddly enough, keeps me from getting as oily throughout the day. 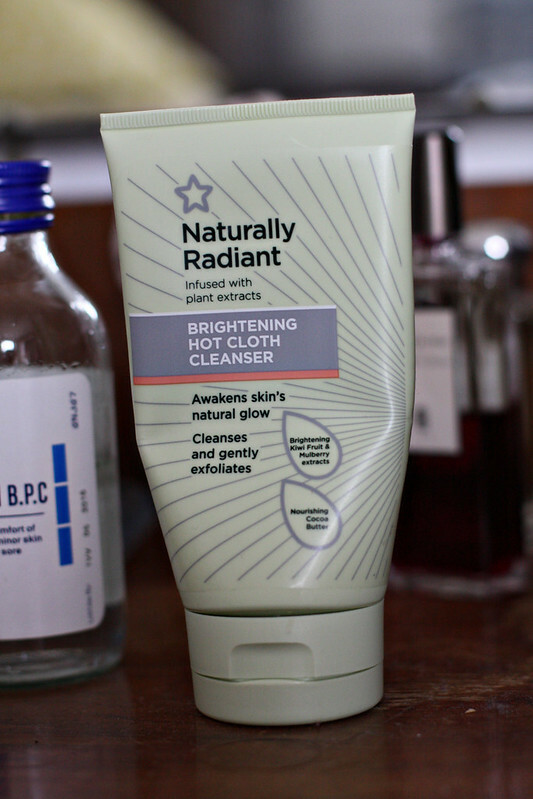 Is that 'Brightening Hot Oil Cloth Cleanser' by Superdrug? I've been using their mud masks for years and they've changed their range slightly. I tried their new Witch Hazel mud mask and it was just as good! I usually buy the plain one, so this witch hazel infused one was an improvement. As much as I loved learning more about some of your most truest and frequently used beauty products, I also (equally) adored getting to see glimpses of your vanity table and tiered dessert stand full of marvelous jewelry. As a wearer of transition specs for almost thirty years, I can say that it makes a huge difference to eye lines…so, sun shades, ladies, sun shades! But genes do most definitely play a part in it, I got lucky there, I have to say. For which I am grateful. Well, as regards the wrinkles, I won't go into the rest! I use Aloe Vera mixed with Argen oil and a little rose essential oil as a moisturiser, the Argen doesn't smell all that nice. Unfortunately I can react really badly to a lot of make up and skin stuff. Including, weirdly enough, the aforementioned Botanics. That little red tin is just so covet inducing! I haven't heard of it before. Must go and waste time looking everything up, now.